This “substitute” legislation that will the subject of a hearing in a House subcommittee today doubles down on efforts to blocks states from requiring GMO labeling. The new version also block states from regulating how GMO crops are produced. Like the version of H.R. 1599 introduced earlier this year, the new version would also sharply limit FDA’s ability to craft a national GMO labeling system. But, the new version would go further by restricting the ability of food manufacturers to make voluntary non-GMO claims by giving USDA exclusive control over such claims. Block state GMO labeling laws, including the mandatory GMO labeling law slated to take effect in Vermont in July 2016. Block state efforts to regulate GMO crops to protect farmers and other rural resident from economic and environmental harms, such as pesticide drift. Block all non-GMO claims that have not approved by a new USDA certification program that could take years to establish. Prohibit food companies from suggesting that non-GMO foods are superior to GMO foods. The new bill unmasks the basic anti-consumer sentiment of the bill’s proponents, led by Rep, Mike Pompeo (R-Kan.). Rather than requiring a simple mandatory disclosure and allowing companies to rely upon existing FDA guidance to make non-GMO claims, the new version of the DARK Act effectively denies both mandatory and voluntary means for consumers to know whether their food contains GMOs. This is especially shocking in light of new polls by the Mellman Group and Consumers Union that show nine in ten Americans want mandatory GMO labeling – regardless of age, income, education, race or even party affiliation. Consumers simply want the right to know what’s in their food and how it was grown – a right held by consumers in 64 other nations. Including a simple disclosure on the back of the package will not increase food prices. Food companies change their labels all the time to highlight new innovations, and a value-neutral disclosure on the back of the package will not cause costly supply chain disruptions. What’s more, food companies and farmers have been separating GMO and non-GMO grain for decades to serve export markets and growing demand for organic and non-GMO foods. This new assault might be driven by a recent finding by the world’s cancer experts that glyphosate, an herbicide used in tandem with some GMO crops, is a “probable human carcinogen.” What else could be driving efforts to not only restrict labeling of GMO foods but also their regulation? The use of glyphosate has exploded in recent years, forcing farmers to resort to more toxic herbicides linked to other serious health problems, including Parkinson’s disease. While farmers are on the front lines, hundreds of elementary schools are also within a few hundred feet of corn and soybean fields. Why would farm state legislators like Rep. Pompeo restrict state and county efforts to protect farmers and other rural residents from dangerous herbicides? The reason is that some food, farm and biotech companies will do whatever it takes to frustrate your right to know what’s in your food and how it’s grown. 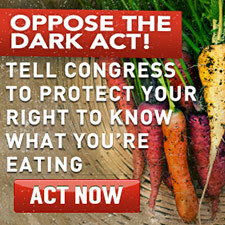 But, by linking an assault on consumer rights with an assault on the ability of state and county officials to protect public health, the DARK Act has become so toxic that even Congress must reject it.